A "name" (Net, Host, Gateway, or Domain name) is a text string up to 24 characters drawn from the alphabet (A-Z), digits (0-9), minus sign (-), and period (.). Note that periods are only allowed when they serve to delimit components of "domain style names". (See RFC-921, "Domain Name System Implementation Schedule", for background). No blank or space characters are permitted as part of a name. No distinction is made between upper and lower case. The first character must be an alpha character. The last character must not be a minus sign or period. 3) If the scheme component is defined, indicating that the reference starts with a scheme name, then the reference is interpreted as an absolute URI and we are done. Otherwise, the reference URI’s scheme is inherited from the base URI’s scheme component. 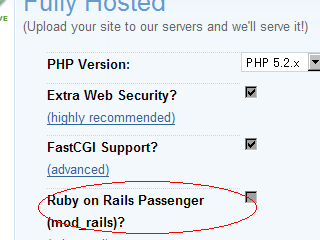 As of today, all DreamHost customers can enable Passenger (mod_rails) for Ruby on Rails applications. No need to sign up, nothing to download! Follow its evolution from your web browser. My Life Between Silicon Valley and Japan – Lingrリベンジ成功おめでとう。150人チャットを1時間半やったよ!! !